My life has been crazy for the last month. 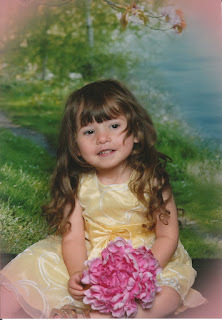 It started off with a phone call from my mom, letting me know that my neice, Cierra, was being rushed to the ER. She was on her way home from Idaho and asked me if I could go to the hospital to be with my sister. When I got to the ER, my neice was hooked to wires and she would thrash around and would not respond or look at anyone. It was the saddest I have ever seen. My nephew, Cierra's older brother Christopher, was sick the day before with a fever, sore throat and a cough. The doctors said it was the swine flu and gave my sister a prescription for Tamiflu. The next day Cierra started showing the same signs, so she called the doctor and he said to give her the Tamiflu. About 3 minutes after taking the medicine, little Cierra started have seizures and her lips were blue. That is when she was sent to the ER. They then sent her to pediatrics to try to get her stablized. She quit breathing and then they life flighted her to Primary Childrens in SLC. She was in a coma for about a week, when she woke up we were suprised of the outcome. She didn't know anyone. She couldn't talk, walk, respond, nothing... You would look her in the eye and she would look at you like she didn't even know who you were. It was heartbreaking. After 3 1/2 weeks in the hospital she was able to come home Thurday. Her eyes are open and her ams and legs have movement/ She will squirm while being held if she is uncomfortable and will let out a weak cry. As of yet there is no noticeable response to anyone. The bottom line is that they don not know when or if she will recover. The flu and pheumonia caused brain damage. At first they told us that the MRI's did not show any brain damage. After the secon d MRI we were told that there was no large localized brain damager but there were speckels of damage scattered throughout her brain. Wednesday they admitted that since she has not fully awakened from her coma that they can only conclude that she has more damage than originally thought. They do not call it a coma any longer because she is somewhat awake. She has a feeding tube in her stomach, and she now has to re-learn everything she has been taught. She is practically like a newborn. It has been really hard on me to hear this and then I saw her on Friday for the first time and it was heart breaking. My parents say she has made wonderful progress. She makes sporadic movements and is looking stronger every day. This has been really hard because this only happens to people on tv. You see it on Dateline or 60 min. But for me this is real life and I have a hard time accepting it. I know this is a depressing post but I feel like people need to know what the Swine Flu can do. We are continuing to hope and pray that we will get our little Cierra back. She was so full of life and she loved everyone. She loved Dora the Explorer and that won't even get a reaction out of her. She is the sweeting little angel and I hope that one day she will come back. That's really sad! Has she had a blessing or anything? Are the doctors sure it was the swine flu that caused the damage and not a reaction to the Tamiflu? Hope she gets better. Yeah, she has had a blessing. They are sure that it was the swine flu and her fever was so high that it caused her to have seizures. That is what caused the brain damage. She gets stronger every day! I read this and got Marley's swine flu vaccination today. I hope the best for your niece.